Melissa from Mel’s Art Buffet is an office manager by day, creative whirlwind by night. 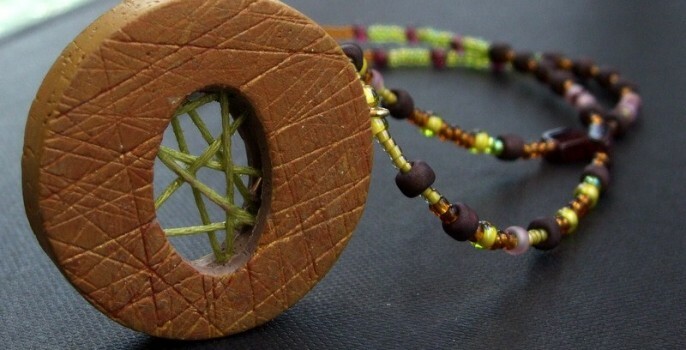 She’s turned Celiac disease from a burden to inspiration by re-imagining her favorite foods with seed beads and polymer clay. Self-diagnosed with AADD (Artistic Attention Deficit Disorder), Mel always has three or four project in progress and pushes herself to try new techniques. What made you turn to food for inspiration? Some people pull a fabric swatch for inspiration, drawing from the beautiful colors and exotic designs. Food is my fabric swatch. I love to pull a color palette from a mouth-watering dish you can’t take your eyes off of. The dark, cheesy corner of a casserole; the vibrant, fresh greens in a bundle of asparagus. Food is beautiful and undeniably inspiring. I find unexpected color combinations fresh out of the oven or picked from the garden. I was diagnosed with Celiac disease in 2004. The disease is auto-immune, which means the body attacks itself with an immune system response. Celiac disease is triggered by gluten, which is found in wheat, rye, barley and oats. Many of my life-long favorite foods are off-limits now. I eat visually what I’m not allowed physically. Thankfully I’ve always had a passion for cooking, so I have a bookshelf full of cookbooks with amazing photos. I enjoy the challenge of adapting recipes and I crave the visual candy. Tell us about your process from inspiration to finished piece. I draw sketches throughout the day at work. Some days I’ll leave work with a handful of sketches covered in notes. I have hundreds of sketches waiting for a chance to come to life. A concept will pop into my head – if I close my eyes and concentrate, I can see the construction process from start to finish. Food photos inspire me, especially from Foodgawker. The layout and placement of food is equally as stimulating as the colors. Food artists have so much to offer, I admire their work as much as a conventional artist. I put the sketches, ideas and color palette together and see what happens. Not all my pieces are so carefully orchestrated – many happy accidents happen at my workbench. 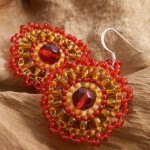 Tell us about the transition from seed beads to polymer clay. I was ready for a change of pace. I love the freedom of polymer clay. I remember leaving work one day and telling my best friend, “I’m gonna do it. I’m jumping on the polymer clay train.” There’s been no looking back. I feel like I will stay with polymer for a while; it gives me everything I want, and is so friendly with the materials I throw at it. You’re able to create such unique designs – what tools do you use to sculpt the polymer clay? I wish I had a ton of secret tools to share, but really I just find myself trying to construct a mini Michael’s in my home studio. I use a 40-50% coupon every week and buy one item – though I’ve been known to buy more than one! I find myself using tools to compensate for my lack of skill with polymer clay. I have a long way to go and so much to learn about the medium. I’ll immediately grab a texture tool to hide flaws instead of learning to avoid or work around the flaws. But texture is so exciting – I love that it can be found anywhere. My favorite texture tool is a ball of aluminum foil. I have another clay tool that I love, although I’m not sure what it’s called. It’s a fan of metal bristles. I love the affect it creates – it can cover more area than poking holes one at a time. If you put your texture eyes on, you can find options anywhere and everywhere. Also, don’t be tied to clay tools. Many fondant, icing and baking tools from the food section can become your best friends with polymer clay. I see on your blog that you’re making a ring a week – where did you get the idea? 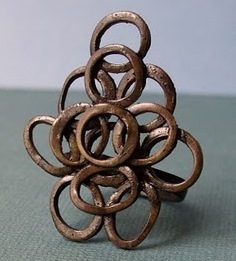 I came across the the Ring a Day group on Flickr and I remember thinking, “You have to be kidding me.” These amazing artists are creating one ring a day for a entire year. So very impressive, what an amazing commitment. I was reading through the discussions in the group about the 2011 project for Ring a Week (RAW). Now we’re talking, that’s more my speed. I decided to make the commitment to challenge myself and participate. It has been a huge undertaking, but so worth it. I love mingling with talented artists I might not otherwise meet. Most importantly, it has tested my creativity and forced me to think outside of the box. Submitting my first RAW ring was so scary; I felt so out of place and nervous, but I was welcomed with wonderfully kind comments and felt right at home. You’re on ring 32 of your 52-week journey, yet there are only 2 rings in your Etsy shop – where do they all go? 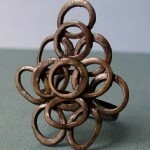 I created the two rings in my Etsy shop before the RAW journey. I’d only made two rings when starting RAW, so I was a little outside of my comfort zone. The rings, now 34 strong, are hanging on bent paperclips on the side of a bookshelf. I hope to gradually migrate them to Etsy, but it can take me 10 to 20 days to prepare Etsy listings. That is so embarrassing but true. Working 60+ hours a week at my day job leaves little time to foster my passion. It pains me that I’m not able to do more. Do you find that the stresses of your day job impact your creativity when you get home? It greatly affects my creativity, motivation and energy level. Time is a huge issue. I spend all day thinking about crafting and counting the seconds until I go home; then once I’m home the time pressure makes it hard to get in the zone. After work I exercise and meditate, then there’s only so much time before going to bed early enough to do it all again. It’s a vicious cycle, I’m chasing my tail at work and at home. My favorite part of Etsy is the QYDJ series – I read each story with concentration and vigor. I check to see if there is a new post almost every day. What new materials are you working with? I love mixing materials. I find myself drawn to recyclable or throwaway items. I like to see common materials transform into unrecognizable beauties. I’m so excited to get the Torch-Fired Enamel Jewelry book. Enamel jewelry, no kiln required. I can’t even tell you how excited I am. I’ve always had big love for enamel pieces. 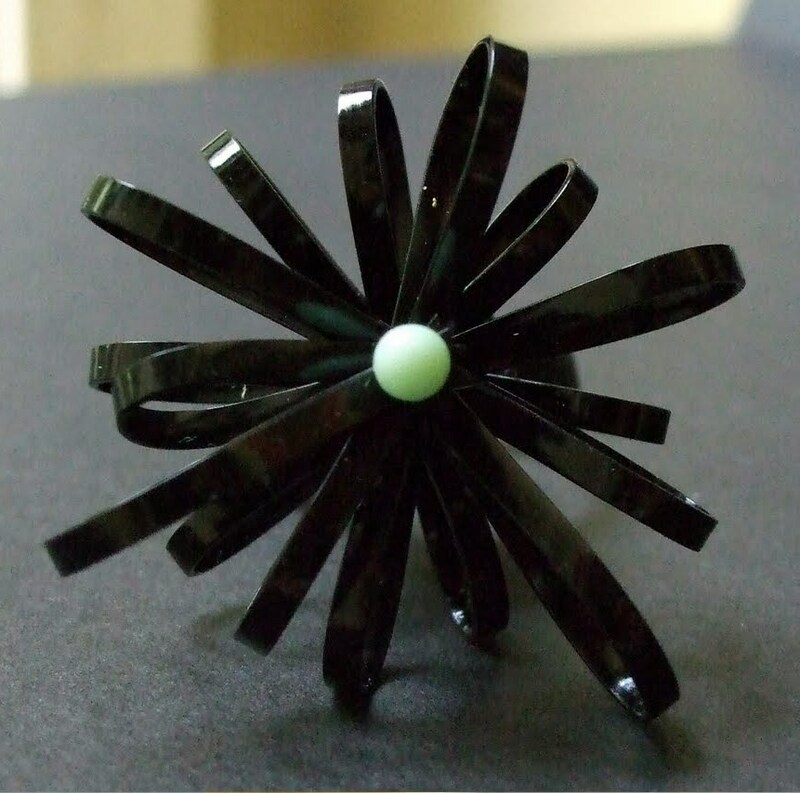 The bead creations in your ECrater shop are not in your Etsy shop – why the separation? I had brief moments of success on Ecrater, but I mainly focus on Etsy. My brain is extremely sequential and compartmental. It threw my head into a tailspin to imagine one piece of jewelry listed on two different venues. Maybe one day I’ll be able to work it out. No doubt it would be beneficial to show these works in my Etsy shop. If you had just one wish for your Etsy shop, what would it be? My huge wish is for my Etsy shop to take off, faster and wider than I could ever imagine. I want to be plagued with the burden of struggling to keep up with orders. It’s been my lifelong dream to be able to support myself from making things. I have to make things to survive, so I would like to be able to survive because I make things. This is my passion. I want it so bad it hurts. 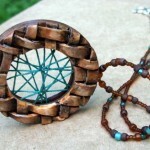 Check out Mel’s Art Buffet on Etsy for more of her beautiful clay jewelry. Melissa is also on Facebook and posts her RAW challenge to the Mel’s Art Buffet blog. She leaves me hungry for both food and success.